Jill Cirasella is Associate Librarian for Scholarly Communication and Digital Scholarship at the Graduate Center of the City University of New York. In this position, she oversees scholarly communication initiatives, thesis/dissertation services, and digital scholarship services. Jill’s research focus is scholarly communication, broadly construed: her projects include anxieties surrounding open access, attitudes about practice-based library literature, and the professional experiences of hard-of-hearing librarians. (See publications and presentations.) She serves on the boards of three open access journals (Journal of Librarianship and Scholarly Communication, Urban Library Journal, and Art History Pedagogy & Practice) and is driven by a commitment to open scholarship. Seeking to promote open scholarship at CUNY, she co-founded the Open Access @ CUNY blog (now Open @ CUNY), steered a University Faculty Senate resolution in support of the creation of a CUNY-wide open access repository, and worked with the Office of Library Services to make the resolution a reality. She currently co-chairs the OLS Scholarly Communications Committee and the LACUNY Scholarly Communications Roundtable. 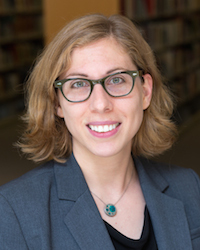 Before coming to the Graduate Center, she worked for eight years as a reference and instruction librarian at Brooklyn College, where she developed expertise in science librarianship, peer mentoring, and evolving modes of scholarly communication. Previously, she was the librarian and archivist of the Dance Notation Bureau, where she continues to serve on the Professional Advisory Committee. Jill earned a B.A. in computer science from Amherst College, an M.S. in library and information science from Simmons College, and an M.S. in logic from the Universiteit van Amsterdam’s Institute for Logic, Language, and Computation, where she studied on a Netherland-America Foundation Fulbright Grant.